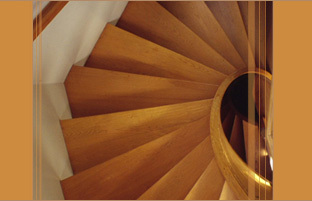 Stair parts, treads and vents are a critical part of the total solution for a floor covering installer. Since many distributors overlook these components or let others supply them, they miss a lot of opportunity and more importantly, a way to add value for their customer. In today’s market, handscraped or distressed prefinished flooring is a strong seller, and many customers want wood vents, mouldings, and stair parts with the same look and feel. We can provide those materials for you. What if your customer has a curved or special shaped landing or custom sized or shaped transition requirement? Presently, that demands a highly paid specialist to come out on site to fabricate and finish hoping it will look similar to the floor and moulding. We can do that for you too. Send us the specifications, and under controlled factory conditions, we will fabricate the parts and finish them with a professional factory finish. Why not offer more to your wood flooring customers than just standard transitions and mouldings? After all profitability is the goal and adding value is what differentiates you from your competition. Some suppliers out there will offer a wood vent assortment, however Millwork Concepts is the only manufacturer that offers all of the components necessary to complete a project. Remember, we can do most anything which allows you to be the TOTAL solution, giving you the opportunity to satisfy your customer and add to your bottom line.